Earlier today, I shared out an invitation to annotate a video by Leonardo Flores and the Networked Narratives folks who hung out with him. (You can still annotate the video). It helped that we have a two-hour winter weather delay this morning, so I immersed myself in the NetNarr experience. 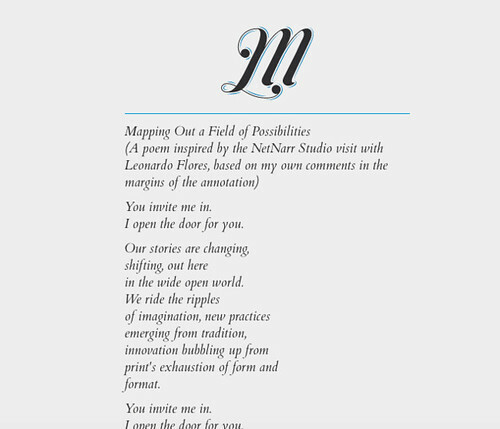 As I was thinking about how best to reflect on what I learned and heard, I wondered if (given Flores’ interest in digital poetry) I could use my own comments to create a poem about the theme of the Studio Visit, as I knew it, from afar. I did create a poem. You can read it — Mapping Out a Field of Possibilities — over at Notegraphy. What I think, for me is interesting, is that the discussion about the use of “twitter bots” to “scrape” text from tweets and create something new raises all sorts of questions about what is writing when algorithms are in place, and who owns the writing (and does that even matter on a digital canvas?). Here, I made myself into a sort of “human bot,” scraping through my own annotations and musings (along with quotes from others in the session that I had pulled out into the margins) to make a poem. I am not a bot. I just played one here sometimes. So, would the poem be any different if I had been a programmed Twitter bot and had done the same thing? Such interesting things to wonder about, right? Another point: I would have liked to have had more time to add other layers to the writing — to create audio linked on top of the words, perhaps, or maybe, shifting the poem’s stanzas into Zeega for a multimedia compositional experience or maybe layering links to the people whose words I, eh, remixed for the poem, an associative anchor to people from the poem. I might still do something. As it is now, the poem is experientially flat, even as it is read on the screens. The poem is merely words on the “page.” I’m not suggesting that this kind of writing is not exciting or interesting or valuable (certainly, it is) but I continue to be curious about how to push writing into new directions. Love that you introduced the word “scrape” here Kevin. It has a violent/visceral connotation, no? It seems it could be painful. Is writing via scraping (thanks to the algorithm) a really a shift towards the new? If so, what writerly cost is exacted in that shift towards this new way to write? To “scrape” our memories, experiences, personal knowledge to computationally design openings for others to experience a new….. isn’t that what analog writing is too? Just thinking our loud here…. It’s a gentle scrape … only a band-aid needed.